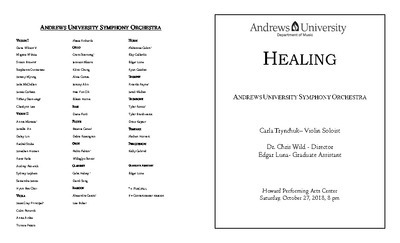 AU Symphony Orchestra under the conduction of Chris Wild featuring works of Mozart, Verdi, and Ravel. 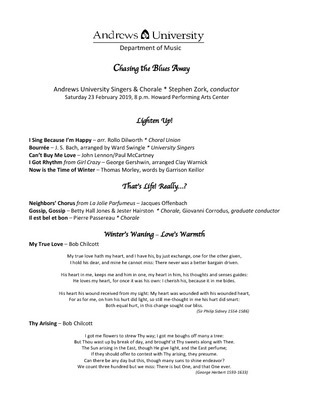 University Singers and Chorale under the direction of Stephen Zork, featuring works by Bach, McCartney and Lennon, Offenbach, Chilcott, Rutter, and Gershwin. 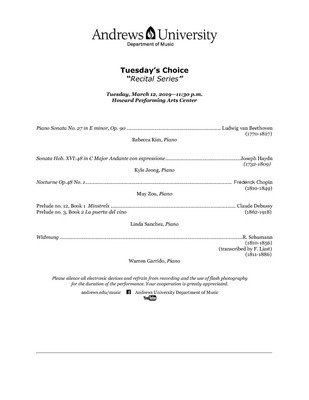 Students from the department of music featuring works by Mahler, Bach, Beethoven, and Bruch. 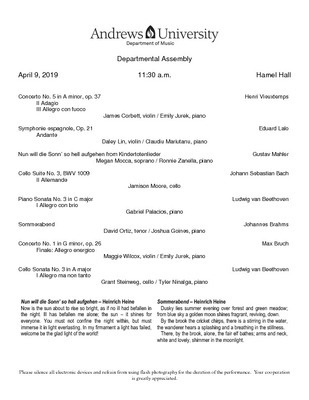 Students of the Department of Music featuring music by Telemann, Bach, Beethoven, and Paganini. 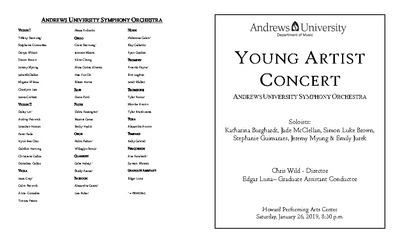 Students of Carla Trynchuk and Christopher Wild featuring works by Bruch, Bach, Vieuxtemps, Lalo, Williams, Mendelssohn, Tchaikovsky, Wieniawski, Prokofiev, and Ravel. 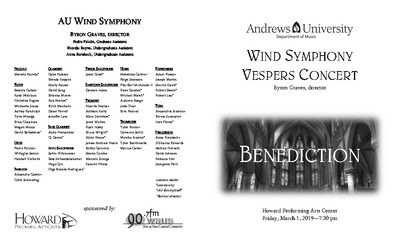 Andrews University Wind Symphony under the conduction of Byron Graves, featuring works by Ticheli, Hazo, and Stevens. 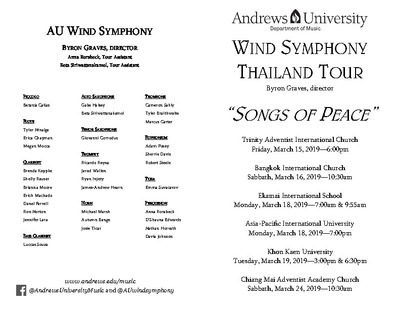 March 2019, AU Wind Symphony tour several places in Thailand. 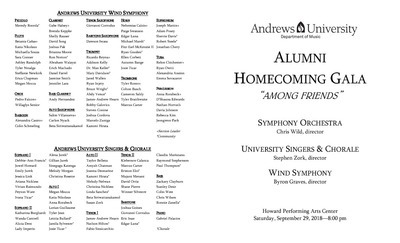 AU Symphony Orchestra, under the direction of Dr. Chris Wild, University Singers and Chorale, under the direction of Stephen Zork, and AU Wind Symphony, under the direction of Byron Graves, featuring works by Beethoven, Haydn, Gounod, Kirchner, Sousa, Copland, and Wilhousky, among others. 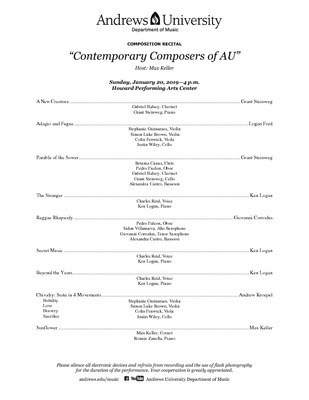 AU Symphony Orchestra under the direction of Dr. Chris Wild featuring works by Mozart, Sibelius, Piazzolla, and Brown. 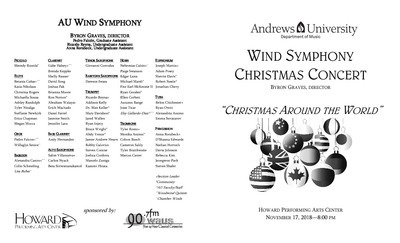 AU Wind Symphony under the direction of Byron Graves featuring holiday music from Medieval Europe, England, Spain, Israel, Russia, Canada, and the United States. 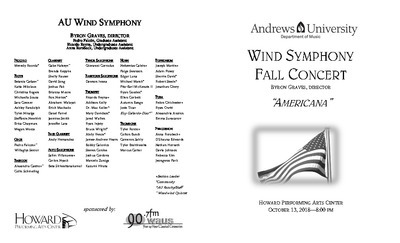 AU Wind Symphony under the direction of Byron Graves featuring works by Sousa, Copland, and Bennet. 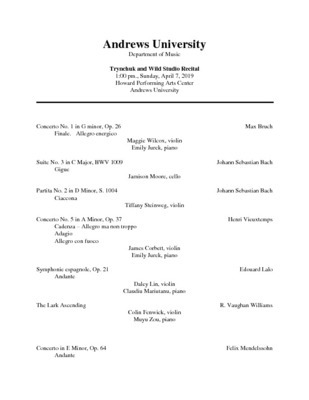 AU Woodwind Quintet featuring a piece by Gershwin. 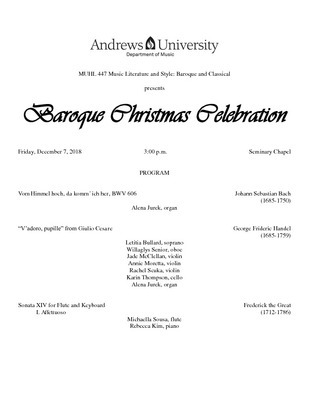 Students of Music Literature and Style: Baroque and Classical, featuring works by Bach, Handel, and other Baroque composers. 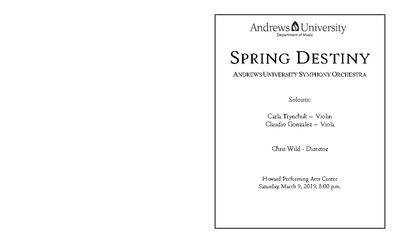 Students of the Department of Music featuring works by Mendelssohn, Schumann, Debussy, Ewazen, and Schubert. 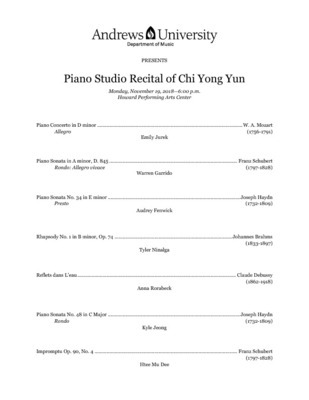 Chi Yoing Yun piano students featuring works by Mozart, Schubert, Haydn, Brahms, Debussy, Beethoven, Chopin, and Mendelssohn. 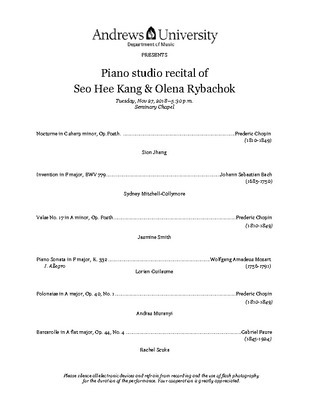 Students of See Hee Kang and Olena Rybachok featuring works by Chopin, Bach, Mozart, and Faure. 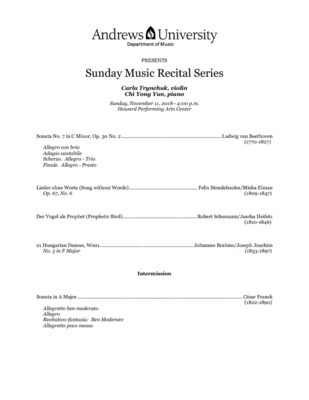 Carla Trynchuk (violin), and Chi Yong Yun (piano) featuring works Beethoven, mendelssohn, Schumann, Brahms and Franck. 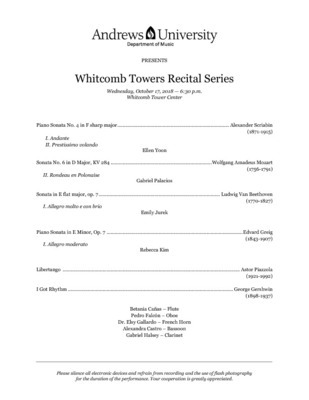 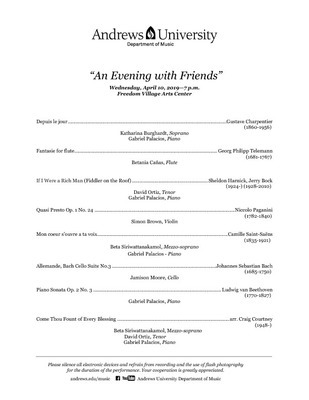 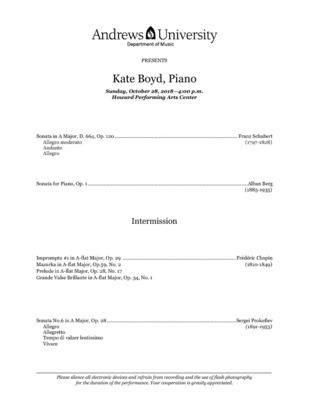 Kate Boyd featuring pieces by Schubert, Berg, Chopin, and Prokofie. 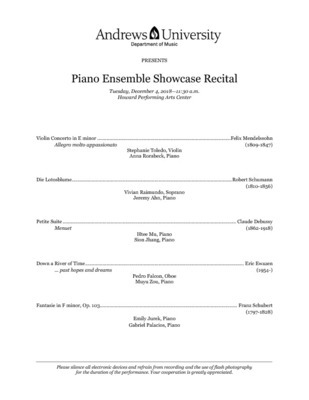 Students of the Department of Music featuring works by Scriabin, Mozart, Beethoven, Greig, Piazzolla, and Gershwin.